The afternoon of day 4 of our trip saw us in an urban forest in Tampere. The urban forest is situated on an Esker, between two lakes, and is about 60m high. T he woodland has been in existence since the last ice age when the ice was up to 4km thick. The oldest trees are about 200 years old but with smaller girths than we would expect in Scotland. The soil is mostly gravel so trees do not grow particularly well. Although forest cover was never really lost, this forest has been used in the past for timber and cattle were also allowed to graze in the area. The objective for urban forestry in Tampere is to have a range of different ages and layers, and thinning is done in small clearings. No permission is needed to fell trees, but the intention to fell is announced in case an area is protected, and the area also closed off to the public. 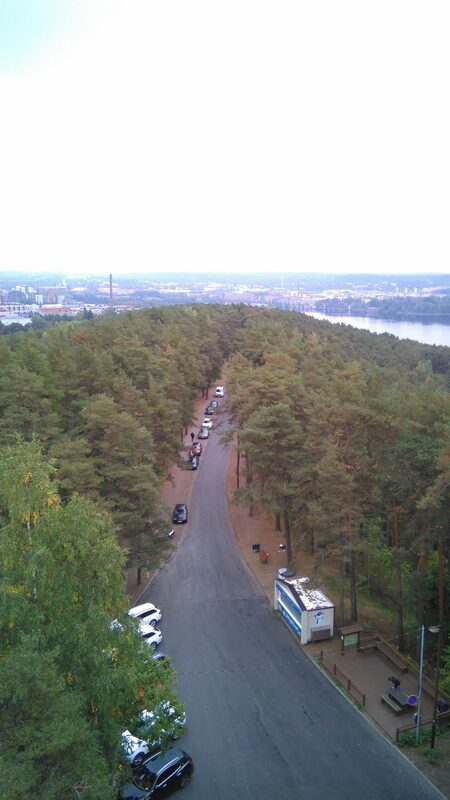 Panorama of the urban forest taken from a tower built in 1929 to replace the original one built in 1888 that was burnt down in the Finnish civil war. The woodland is not very diverse in terms of species, limited to mostly spruce, pine and birch. There is a healthy understory of rowan but rowan is not considered a “proper” tree, and is cut down here to keep the views open and to limit competition with other trees. We noticed a lack of deadwood and found out that that is not liked by the public. Same as in Scotland there are potential conflicts between the built environment and nature conservation. Interestingly, if an area is protected and it is threatened by development then the case is straightforward: development should not be allowed. However if the area is not protected but special species have been identified, then the case is less straightforward and this creates conflict. Green land in between cities and towns is also under threat from housing demand, however, compared to Scotland the conflict is not as heated due to the fact that Finland has more land and less people. It would be interesting to follow how this evolves in the future as the population grows. Introduction and Finnish Forestry Overview Over two-thirds of Finland is forest cover. This expanse of forest cover may be one of the reasons most of the population seems to be well connected to nature, because most people live within reach of nature. Not only do people live near nature, but many are able to own a small piece of it as much of the forested area is owned by private persons. Accessibility is also important because many people are able to use the forest, even if they do not own any forests themselves. Subject to certain rules and regulations, people are able to use the forest and the wildlife within it as a renewable resource for wood products, hunting and foraging. Above all, most Finnish people strongly value the link between being in nature and good health.